Please note that the content of this book primarily consists of articles available from Wikipedia or other free sources online. McMillan Park and Sand Filtration Site is a twenty-five acre green space and decommissioned water treatment plant in northwest Washington, D.C. connected to the McMillan Reservoir. It is bound on the north by Michigan Avenue, on the east by North Capitol Street, on the south by Channing Street and on the west by First Street. 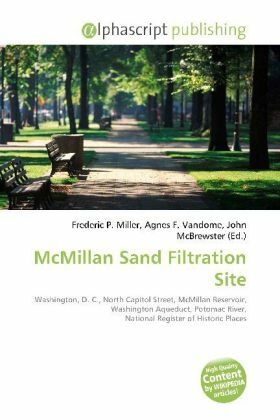 Two paved courts lined by regulator houses, tower-like sand bins, sand washers and the gated entrances to the underground filter cells provided a promenade for citizens taking the air in the park. Below grade there are twenty catacomb-like cells, each an acre in extent, where sand was used to filter water from the Potomac River by way of the Washington Aqueduct. It was in use until 1985 when a new rapid sand filter plant replaced it across First Street beside the reservoir.